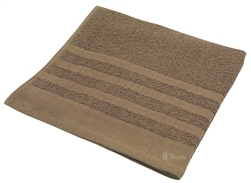 U.S. Army style barracks Bath Towel is made of 80% Cotton and 15% Polyester terry cloth. Makes a great camp or PT towel. Edges are bound. Measures approximately 22" x 42". Standard Army brown shade.